CIBEDO was founded by the White Fathers in the late 1970s. Today, it is the department of the German Bishops’ Conference for the dialogue with Muslims and research about Islam in Germany. 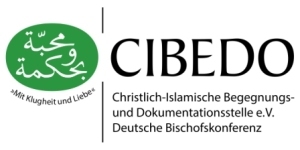 CIBEDO stands for Christlich-Islamische Begegnungs- und Dokumentationsstelle, which could be translated as “Centre for Christian-Muslim Encounter and Documentation”. The logo, which can be seen in the top left area, contains an arabic writing, which can be translated to „with prudence and love“. It originates from the second vatican council document „Nostra Aetate“ and serves as a motto for CIBEDO. The main motivation behind the initiative had initially been to help Muslim guest workers, who came to Germany in the 1960s and 1970s, to gain access to German society as well as to create an infrastructure for their spiritual needs. The huge majority of them came from Turkey, but a significant number also came from Morocco, Algeria and former Yugoslavia. Another motivation was more academical, i.e. to accumulate information about Islam and the development of Islam in Germany. Islam is a rather recent phenomenon in Germany, because prior to the 1960s and due to reasons of colonial history, it did not play a significant role contrary to France and the UK, for example. To cope with the new situation and the lack of knowledge in Germany, the White Fathers started to gather material to form a large documentation base. For a long time, the documentation consisted of written contributions and articles in the form of thematic files, which are still maintained and updated today, with recent additions being digital. Apart from the documentation, the White Fathers built a library, currently consisting of about 12,000 books on Islamic Studies, Christian-Muslim dialogue and Islam in Germany. Today, this library stands out as the largest for Christian-Muslim dialogue in Germany. Around 20 years ago, the Catholic Church in Germany realized the increasing interest and relevance of these topics not only for Christians, but also for society in general. As the White Fathers decided to retreat from the institution in 1998, CIBEDO became a department of the German Bishops’ conference. Today, CIBEDO’s office is located in the main building of the Jesuit Graduate School of Philosophy and Theology Sankt Georgen/Frankfurt am Main. CIBEDO currently has five employees, a secretary and a librarian, as well as three academic posts, two of them being theologians and one of them being an Islamic scholar. To continue the work started by the White Fathers with CIBEDO as a centre for documentation and research it was opened to the public. Scholars and people working for or interested in dialogue may contact us for information. Our library and documentation is available for research online. Additionally, CIBEDO’s website offers further relevant material, e.g. news updates and pastoral guidelines about questions concerning interreligious encounter and Islam. Furthermore, CIBEDO’s own publishing activities include papers and guidelines for dialogue activities. There is a CIBEDO-Beiträge zum Gespräch zwischen Christen und Muslimen, released quarterly, and a book series called CIBEDO-Schriftenreihe on theological topics significant to dialogue, such as the Muslim claim that the Bible, regarded as a genuine divine revelation, has been altered by the early Christian community. Currently, CIBEDO is working on the fourth volume of this book series, which will illuminate the role of Saint Paul in Muslim writings. CIBEDO also serves as the link between the local and national levels of dialogue. In most of the German dioceses, especially with a significant Muslim population, there are representatives in charge of coordinating dialogue activities on local as well as regional levels. CIBEDO is not responsible for these activities in a hierarchical sense, but it offers assistance if requested. Moreover, CIBEDO holds an annual meeting of the dioceses’ representatives to reflect and exchange their experiences on Christian-Muslim dialogue. Another annual conference organized by CIBEDO, the so-called CIBEDO-Werkstatt, provides the opportunity to share opinions about various topics related to Christian-Muslim dialogue, especially from a Catholic point of view. CIBEDO as a national organization is part of several institutional networks, dialogue activities and committees, like the subcommittee for Christian-Muslim relations of the German Bishops’ Conference. CIBEDO also liaises and cooperates with Muslim organizations and their umbrella organizations on a national level. In addition, CIBEDO participates in further initiatives concerning interreligious dialogue in Germany, for instance in the so-called “Runder Tisch der Religionen” or in the “Abrahamisches Forum”. Yet another area of responsibility includes science and teaching. In cooperation with the Graduate School of Philosophy and Theology Sankt Georgen, CIBEDO offers a qualification programme on Islam and Christian-Muslim encounter for students of Sankt Georgen. Referents of CIBEDO are often asked to hold seminars or lectures on a wide range of topics concerning Islam and Christian-Muslim dialogue, as well.